by Dave from The Longest Way Home ~ November 16th, 2010. Updated on February 20th, 2015. Published in: Travel blog » How to guides ... » Philippines. Camiguin island is located in the Bohol sea, just 90 kilometers away from the north coast of Mindanao. The island has a road that goes entirely around its 64 kilometers. So yes it’s quite small. Camiguin island’s name “island born of fire” is well deserved, and is quite interesting. Mt. Vulcan was the first known recorded eruption in 1871 as it burst up through the island in a series of violent earthquakes. In late 1875 the Challenger expedition (British scientific ship) noted the still smoking volcano. 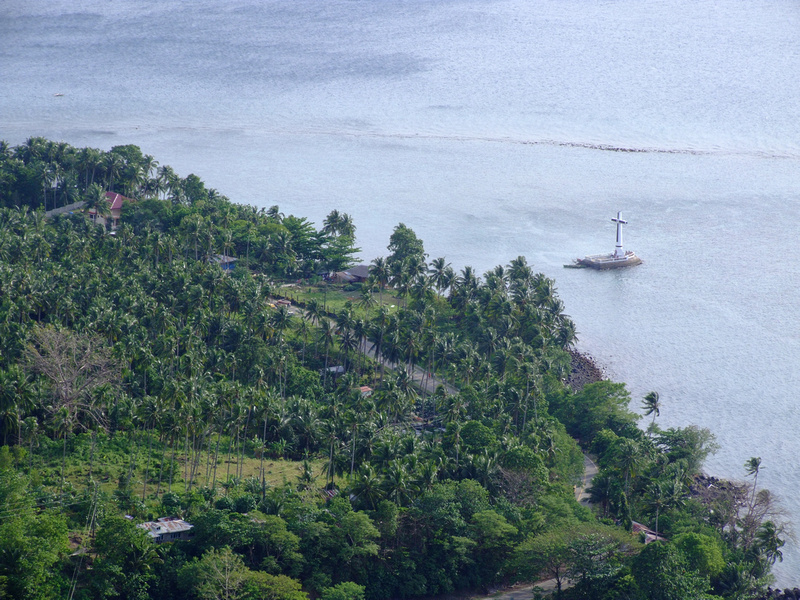 During this period the land where the islands cemetery was located sank during a violent earthquake. Thus creating todays popular and historical site “The Sunken Cemetery” where in 1982 a huge cross was erected as a memorial. The last main eruption was in December 4, 1951 when Mt. Hibok-Hibok took the lives of 1000 people. Today Mount Hibok-Hibok is silent, and an easy day climb. Today, Camiguin island is perfectly safe and a beautiful place. What is there to do on Camiguin island? The island was born of fire and has to be explored. Waterfalls – Both Katibawasan Falls and Tuasan Falls offer scenic tropical areas. But ask around for some of the more remote, local waterfalls to avoid the tourists! Ardent Hot Springs – natural hot volcanic water makes for a warm soak. Get there early to avoid the rush! Soda springs, Clear springs … lots of springs – Someone on Camiguin got a bit carried away with naming “springs” everywhere. Most of which are far from natural looking. In fact many just look like small man-made swimming pools. But, locals enjoy them, so they are a national favorite here. There are a few small hidden natural ones, though. And, no. I am not telling. 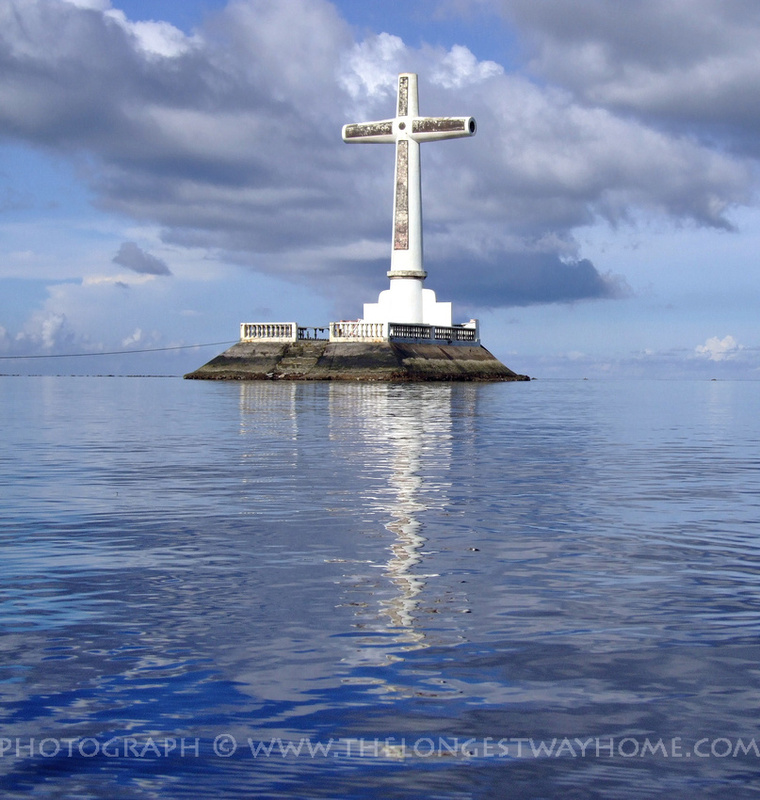 Sunken Cemetery – This is by far my favorite place on Camiguin. 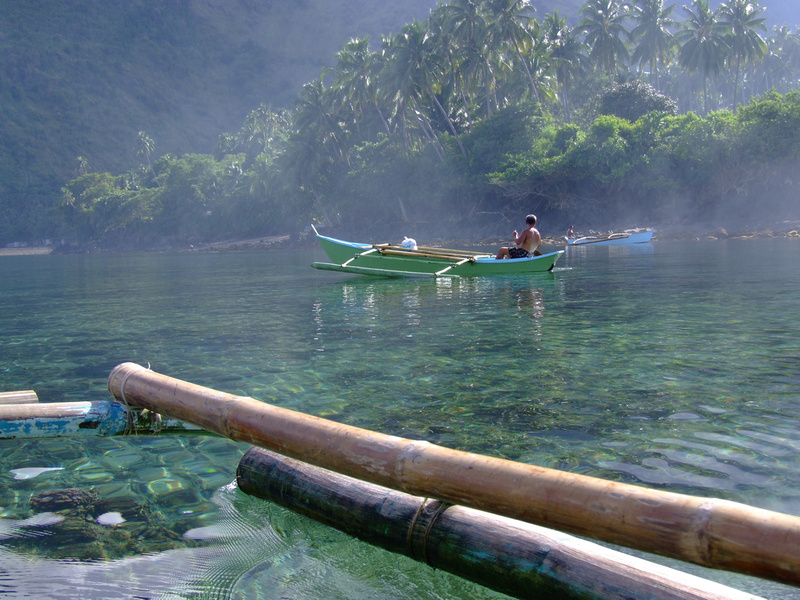 Take a small boat over coral covered tombs lying under the sea. It’s only about 5 minutes across. Or, swim around the tombs. It’s not creepy as they look just like rocks now. But, please see my criticisms of Camiguin further down in this article as it might be gone soon! When is the best time to visit Camiguin Island? Any time really. But you should be aware of public holidays in The Philippines, as the island / ferries are often swamped with local tourists. The Camiguin Island Lanzones festival which is held on the 3rd week of every October. It’s a week-long celebration of the Lanzones fruit. There’s a beauty contest to crown miss Camiguin island, a music show and just recently it looks like they’ve tried to adopt a German Octoberfest style scenario there. 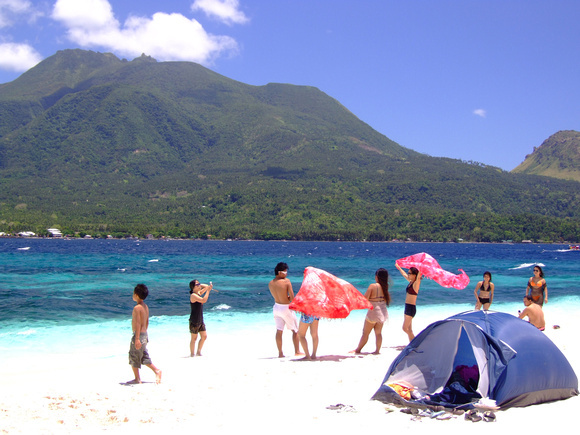 Easter Holidays – Camiguin Island is a popular destination during this time. With many people taking a walk of devotion around the whole island, which takes 16-18 hours or more depending on your fitness level. Many people do this walk at night to avoid the heat. Christians also embark on a hill top walk to visit the “stations of the cross”. How to get to Camiguin Island? You will also find several connecting larger ferries that stop off at Camiguin. Find a Super Ferry desk, or ask your hotel / guest house which one is best for you as they change schedule’s regularly. From Cagayan De Oro you have two only one ferry choice. As of 2014/15 the above Sea Cat service is no longer running. So you’ll have to make do with the options below. From Cagayan de Oro to Camiguin island via ferry you leave via the port at Balingoan ferry terminal. You can either take a taxi to Balingoan from Cagayan De Oro city (2000 pesos) or take a jeepney / bus from the Agora bus terminal (150 pesos A/C). It’s a 1.5 hour trip to the ferry terminal. Ferries leave Balingoan from as early as 5.30 am. Call Super Shuttle Ferry at +63 (088) 3873587; +63 (088)3874034 or +63 (088)387 7009) for more details. You arrive into Benoni port which is 17 km from the capital of Camiguin, Mambajao. Once you get off the ferry, there is sometimes a tourist info desk. Otherwise take a jeepney to Mambajao, or hire a Motorella (tuk tuk), but bargain hard if you take the latter. Resorts and guesthouses offer pick-ups for 450 pesos. The airport in Camiguin is very central with daily connections via Cebu, Manila and Cagayan de Oro. If you are thinking of flying to Cagayan De Oro the airport is located 1.5+ hours out of the city in a town called Laguindingan. So if you are flying to/from Camiguin Island via Cagayan De Oro you will need to keep this in mind. Better yet would be to simply fly to/from Bohol (Tarsiers, Chocolate hills) or Manila/Cebu. There are many resorts in Camiguin so it’s worth booking a recommended Camiguin resort online. Budget travelers should show up very early as public transport is sporadic on the island and it will take time to find a place. As of 2015 budget places start at 550 but 800 per room can still get you very nice accommodation. Check out my Camiguin island resorts online. As I mentioned at the start of this article I have spent a lot of time on Camiguin island. And, was really hoping to make a return to the 2014 Lanzones festival my last destination in The Philippines before leaving. But sadly Camiguin island seems to be caught up in “financial tourism” these days. I desperately searched to find some information regarding the Lanzone’s festival. Only two weeks before hand did a third-party website put up the information. And, it was scattered. Most of the festivities had been moved to evening times it seemed, and there was a huge push on Octoberfest via San Miguel (national brewing company). Emails to random departments I found online went unanswered, and/or bounced back. Still, they have improved in the sense that they are no longer using yahoo.com email addresses. Then again you can always call into the Tourism office on Camiguin. Only to be faced with a huge office, and lots of staff. The problem is, all they seem able to do is hand you a tiny photocopy of the island map, with official prices attached. That is if they have copies, or can be bothered to walk 5 feet to make a copy for you. Less staff, more efficiency and more information would be good. Otherwise, just use your guidebook and avoid the tourism office there. In the end I called one of the boat men I hired previously to confirm dates, along with a hotel there to give me some updates. Before I left I found “sectors” of Camiguin island devoting most of their time using tourism as a cover for “investing in Camiguin.” It’s hard not to talk with anyone there without being pounced on to buy property. This latest festival seemed geared to woo national investors to the island rather than to publicize a previously fantastic festival. The mad push to make Camiguin Island a tourist destination, or investors paradise has resulted in some very annoying traits. As a foreigner don’t be surprised to now see an official price for “foreigners”. This really is the only time I have seen “official” foreigner prices in The Philippines. Argue about prices and who can afford what e.t.c., by all means. But, either way this system is not administrated well. Hire a local motorbike and you will be “unofficially” charged extra on top of an “official charge”, not including the fuel (be warned). Likewise with a volcano climb. So yes, what’s happening here is everyone is trying to make a buck, just like the next person. The result, disorganized annoyance, and ultimately disappointment. Then recently I’ve been told there are plans to open a new ferry port beside the sunken cemetery. The ferry port is planned about 150/200 feet from the cemetery, and will kill off the coral along with the delicate eco system around it. Also, I for one also don’t want to visit this tranquil place when there’s a ferry chugging into port. The good news is that someone listened and the ferry port near the Sunken Cemetery has been stopped. The bad news is that since 2014 Camiguin tourism office have introduced a plethora of fees to snorkel or swim there (it used to be just 20 pesos). Snorkeling around the sunken cemetery is about 45 mins and is still very beautiful with great tropical fish, shell fish and underwater statues to view. A stunning sunken cemetery at sunset. The friendly local boat people taking you out on a paddle boat. The sparkling blue waters around white sandy beaches. Volcano climbing within a tropical forest. And, some of the best Manok (roast chicken) and chocolate cookies in The Philippines (just go to down town Mambajao). I am sure the numbers are booming. Free expense trips, accommodation, and investor meetings will do that. In the short-term. I promised some of the local people who were so nice to me when I was there that I would write this article for them. They feel their voice cannot be heard anymore. I would sadly agree. I really believe a place as ecologically diverse as Camiguin island could be the start of something great for tourism both nationally and internationally for the Philippines. There are a host of additional fees on Camiguin island that mount up. Take a boat to the white island (sandbar) and you pay for the boat, then additional charges for life vests and then there’s the “user fee) of 20 pesos per person. It all grates terribly as you find yourself constantly handing out small change. An overall “conservation” fee for the island at the port would be better. Then again providing litter bins on the streets, beaches or cleaning up the volcanic beaches from local refuse would also be nice. Camiguin island has lots of potential, makes for a lovely weekend away but still needs a push in the right direction. Wow, great informative post. It’s a shame when a place like this gets ruined by bad management. But, you’ve also made me curious to go! Hidden destinations do that I think! Yes, curious places few people have heard about make me want to go too! Camiguin was part of my 5 month backpacking adventure around the Philippines last 2008. I really had a great time. We rented a motorbike and drove around the island… really beautiful. I didn’t go to the Sunken Cemetery… Didn’t even dare to at least snorkel, much more dive.. Cemeteries or ships underwater creeps me so much that I start to panic a bit and hyperventilate haha. I have to agree with you on the roasted chicken.. it’s so cheap and roasted to perfection!! We’ve met several interesting expats living at Camiguin too. One particular guy I won’t forget is an Austrian guy running his own dive shop and resort who attempted to uncover one of Yamashita’s treasure said to be hidden behind one of the waterfalls. He was still under medication when we spoke with him cuz the strong waterfall current pummeled him unconscious. He was lucky to be alive. 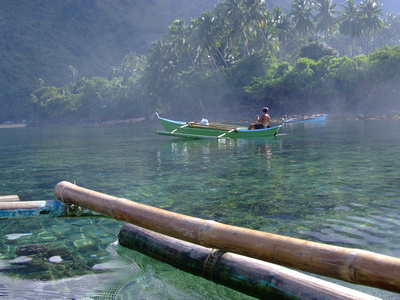 I would love to visit Camiguin again… before it becomes too developed and lose its charm. Prices have shot up since 2008! Though I am guessing a Pinoy will have an easier time getting a good price! Interesting info about the Austrian, there seems to be a few people dotted around the Philippines in search of lost treasure. I am thinking the locals have long since been there! A destination that’s buried deep in my travel bucket list. Sigh. Great info you got here Dave! Thanks! Hope it helps you out! I was here last year! And, I remember a lot of the places you mention. Can i just say well done for putting all that ferry information here! I agree about the springs, a little disappointing. But loved the cross at sunset. It would be a shame if a port was built here. This is why I love your blog, you tell it like it is! I put the ferry info there, as I remember having a problem finding this information myself. That said, it’s all subject to change! you know, this sort of “development” makes me SO sad. UGH!! I haven’t been to Camiguin (shame!)…yet. Planning on going there real soon. What draws me to it isn’t the white beach nor the volcanoes and waterfalls. The frst thing I want to do there is to go to the sunken cemetery and snorkel around it. But from what I just read in your post, seems it can’t be done now. Well, I’ll still try to charm my way into doing that. Thanks for the info-filled post on this wonderful island. Philippines has so many beautiful islands and beaches ! I would love to visit some of those places you mentioned here ! Would make a fun travel photography trip for me ! Thanks for sharing beautiful places & locations in your country ! Yes, The Philippines is one of the few places in Asia where you can capture places not too many place still have! Well worth it! Interesting info about prices of foreigner. Well, I cannot agree you more but they are foreigners, he/she/they even not a resident or a citizen or surely not a national as per said foreigner. Unless if they married a Filipino or Filipino, then that they would not be called a 100% foreigner. Hemm… interesting? ;-) Okay, compare a foreigner in United States, when a spouse married to an American citizen or a National, and his/her paper is still on-going he/she cannot buy with discount unless a foreigner spouse is with her/his husband, a law. There’s something on it that we have to dig-in. In short, there’s a difference really, in USA it’s organize and uses “discounts” or alike for citizens or USA resident but not with a 100% foreigner. On the other hand, in Camiguin or any other places/tourist spots in Phils, just use the word “additional” when a person is 100% foreigner and people cannot understand that. Well, this is such a long story, I just point-out what I understand. Thanks for a great information. I love reading it and thanks for your thoughts. Have a great day and More Power! Hi, to the best of my knowledge, there is no “additional” charge for anyone in the U.S.A. Be they citizens or not, the price remains the same for entrance fees, tours, or guides. From what I understand from your comment, you may be referring to processing fees to become a citizen? In which case there are fees. Just like there are here in The Philippines. Is there a price difference between them? Yes. As they are completely difference economies. Yes though you are right, the word “Additional” fee, is often used over here to mask a “foreigner” price. i retweeted this post with #helpDOT and hopefully your msg reach them about the camiguin tourism website… anyway, enjoy your travel around the Philippines Dave. Thank you Flip. I know the Filipino people care a lot about their country. But, I don’t think the tourism officials actually listen beyond their own four walls. The debacle that happened in regards to the “Kay Ganda” recent Philippines tourism website is an example. Camiguin is another. I have a terrible feeling the same will now occur in other places. A prime example is the Tarsier, who is still not protected outside a few districts. Such a shame. Great post. This looks and sounds like a great place to visit. I’m always looking for islands that are still relatively undiscovered. dude, thanks so much for this post. very very helpful. so sad to hear that almost everyone likes to get their share of bucks. im visiting this island for the first time this coming jan, i hope i can find the quaint place you saw back in 2008.
could i camp with a tent in camiguin? Probably, but finding a spot would be hard, I don’t think there are any official campsites at all. Hello, I intend to bring a group of 10 to Camiguin on April 21 (Holy Thursday). It seems like this is quite a bad time to go considering that a lot of people/crowds would go there as well, but there is no other time for us to go. My question is, are there reservations for the ferries in advance to make sure we are accommodated? And when we get to Camiguin, are there guides who are available to bring us around? Or should we contact a local tour group who can arrange everything from us like pick-up and drop-off at hotel, touring around the island, meals, snorkeling, etc.? Hello, No you can’t book these ferries online. Also accommodation gets booked out quickly. So yes, if you have to be there over easter, I would book with an operator, or if you know someone there to help you. Be prepared for crowds at this time of year too. Never mentioned in this blog just about ever town festival here in Philippines will hose a mountain bike race. Last year, during the Lanzones festival two foreigner friends and I took part. It was a firm 65km push around the island. More like a road race really but quite good fun. Briefly, we rode from Dumaguete to Bohol (via ferry, of course) then caght the ferry to Camiguin. After the race we returned via CdO and Dapitan; a 5 day total trip. Philippines is a superb country for cycling; both racing and touring by bike. paraseacat was no longer operational, ocean jet took their route and schedules. camiguin is still a paradise island……. nice shots of the place. Philippines has really lots of attractions and this is one. Your article is interesting and stimuli zing.wanna go also there.. Thanks for your article. Its very informative. Just wish, you can come back and provide update. I have been planning to take a trip to Camiguin but had put it off two times in 2010 and 2011, due to in my view some unfavorable information. For example, the safety of the ferry boat, often overloaded, from Cagayan de Oro to Camiguin. There is no information when is the ideal season/month to travel by boat, when the sea is calmer. With climate change it’s very hard to say when the best time of year is to go for calmer seas. However “dry” or summer season which should be end of March/April/May/June is more likely to have calmer seas. Festivals such as Easter/Holy week and Christmas should be avoided due to severe overcrowding of ferries. Hi, my name is Ekaie. Thank you so much for this very nice article. I really do appreciate it. I just started writing down possible destinations for my journey including beaches, adventure parks and any tourist spots in the Philippines. I long to travel all natural wonders(and some man-made ones) all over Philippines. I don’t wanna leave this world without achieving that goal. I will hurry up my research so I could go and take a look at Camiguin before it’s totally gone. Again, thank you for this article. One more thing, though. Do you have contact numbers for locals there who could guide me? And maybe, the amenities, accommodations rates as well. I would truly appreciate that, kind sir. I have been to Camiguin so many times. In my opinion the island is like it was 15 years ago but with more visitors coming in. That also means more places to stay and more restaurants. My parents-inlaw own a small resort in Yumbing. I think they still ask very affordabele prices for what is offered. All in all it is still small scale tourism and the locals do want to keep it that way.